Since the Industrial Revolution, coal has been our nation’s dominant power source. This week’s chart looks at the amount of power produced by coal versus natural gas. As you can see, coal’s streak is finally over. 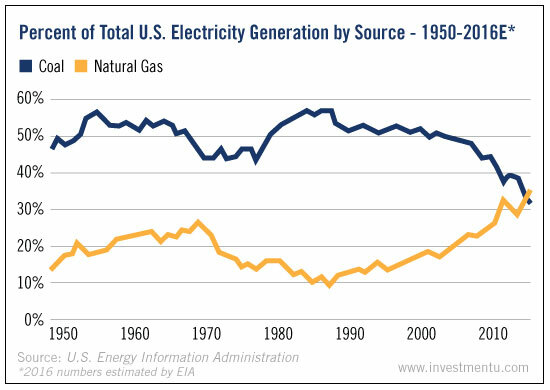 By the end of this year, natural gas will surpass it as our primary source of electricity. Energy and Infrastructure Strategist David Fessler has been following this trend closely. In a recent article for Energy & Resources Digest, he explained the forces behind it. State mandates for renewable energy. Dependent on individual state laws, utilities now have to get 10% to 50% of their electricity from renewable sources. That means utilities are moving away from coal and toward greener energy sources. Dirty coal. Outfitting old coal-fired plants to meet EPA requirements is expensive. So utilities are replacing them with natural gas-fired plants. Cheap natural gas. Prices have rebounded since the beginning of the year. That said, prices are still down 14% from where they were last year. These three factors have created a first in U.S. history: Coal is being overtaken as our No. 1 source of electricity. And the thing about firsts is... they make ideal investing opportunities. To play it, Dave recommends Western Gas Partners L.P. (NYSE: WES). This master limited partnership owns natural gas pipelines in seven states. But it’s especially good news for the companies paid to transport it. P.S. Dave focuses on trends like these in our free sister e-letter Energy & Resources Digest. If you want to learn more about playing the latest commodities trends - an area of the market that is currently experiencing a massive bull market - click here.